Lissa Bryan: Blogger Book Fair is Here! Drawing for My Books! 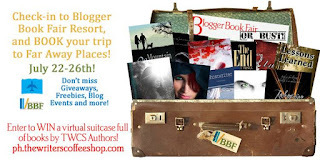 Blogger Book Fair is Here! Drawing for My Books! This year's Blogger Book Fair theme is travel to far-away places. Travel is also a major theme of my novel, The End of All Things. After a horrible plague decimates the nation. Carly and Justin must travel from her home in Juneau, Alaska to a place with a warmer climate, where they will have a better chance of survival. It's a journey across a nation laid to waste by the disaster, but also a journey into love. “I’ve never been out of Alaska,” Carly said. She wasn’t sure she could explain to him how awful a prospect it was to leave everything behind, to give up on the idea the world might return to normal if she just waited there instead of abandoning her hope and home. “Justin, you’re talking four thousand miles here.” The idea of moving into a house across town had been daunting enough, let alone the idea of traveling across most of North America. Justin chuckled. “Once you get to know me, Carly, you’ll find I have everything planned out.” He went out into the hallway and grabbed one of the bags that contained his gear. He opened up the front pocket and withdrew a map. A route had been highlighted, cutting across Canada and through the US, a bumpy line, but almost perfectly diagonal. Die? She gave him a startled look, but he didn’t back off and admit to exaggeration or soften the comment with a shrug or smile. Instead, he looked straight into her eyes, and his steady gaze told her he wasn’t trying to scare her or embellish. He saw it as an inevitable consequence if she were left there on her own, not as a possibility. And gazing into his eyes, Carly believed him. She might have very little experience of the world, but she knew sincerity when she saw it. He truly cared about what happened to her, for whatever reason. Her doubts and fears warred with her instincts, which told her Justin was what he presented himself to be. He was a nice guy with a mischievous sense of humor and a strong sense of honor and duty. Her father had told her to trust no one, but he had also told her about the symbol and what it meant to the men who wore it. “I’m scared,” Carly said. She felt her cheeks warm in embarrassment at the admission, but she felt like he deserved her honesty. You can read the entire first chapter here. The End of All Things is available through TWCS, Amazon, and iTunes. And just to make this even better, you can register to win a "suitcase of books" for your summer travels or staycation! I'm so excited for this giveaway! I've been wanting to read The End Of All Things.